Worst part is that anything button copy has become retarded expensive. I don't even recall the last time I saw an asking price under $200 for anything with reflectors on it. Why is that CA 177 shield beige/yellow coloured instead of white? Was that an old standard? Older sign, faded out to yellow along the numerals . Basically 177 doesn't get much attention and would speculate the signs that are there see several decades of use. It doesn't help when it's 125F in the summer out there in the Sonoran Desert at Desert Center. 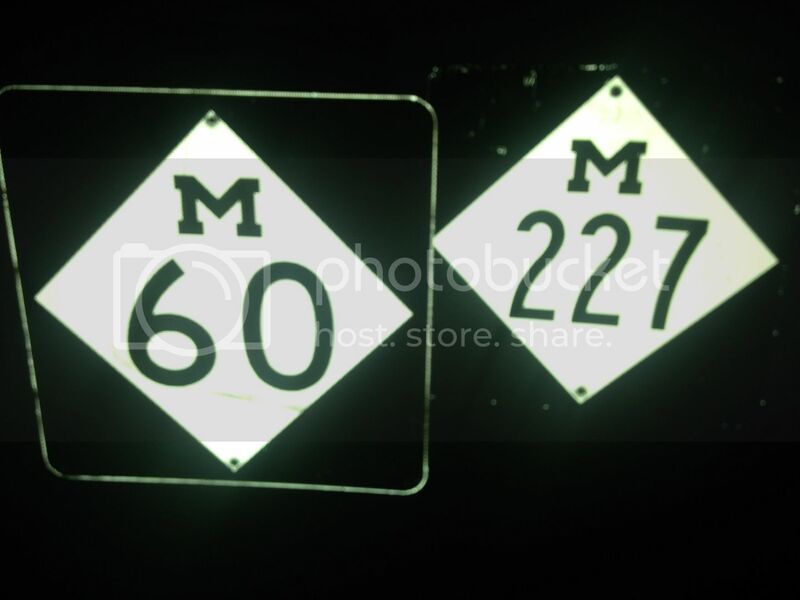 I actually have quite a few western Texas US Route signs with similar era vinyl that basically show the same kind of sun fade on the white shield. Those are even more pronounced and have some heavy cracking on the vinyl. Kind of amazing the damage the sun alone can do if you give it enough time. So where do you guys procure your signs? I used to frequent a lot of swap meets, plate/sign shows and sometimes even antique shops on older highways. Basically those are the places you want to go if you got a ton of time and if you want something old for a reasonable price...just be prepared to look for a long time. More modern stuff is easily available on eBay if you are patient and know what you want. I tend to gravitate to scrap guys since they don't have a sentimental attachment to what they are selling and will generally work with you if you want to purchase a lot from them. So in a way there is some networking involved...I got most of my AZ, NV and MI signs from scrappers clearing out lots of used stuff. There are some collectors that I've come to trust, at least to the extent that they charge market value on a sign or at least something reasonable. Out of all those signs I've listed above I've only paid over $100 three times and never above $178 for any single one sign; two of those were from California...so that's a thing. But then again I just want stuff that has some sentimental value to me, something that I spent time on....a trip, work or lived nearby. Being patient no matter where you look is the key or you end up over paying..
One of the last ones I found was at a "collectable" shop (junk store) near Joplin, MO. There's a good place near Mammoth Springs, AR and as I recall, his prices are not bad. Flea Markets are often overpriced, IMO. Actually I had a second look at the 177 today. Basically the "177" is a vinyl numeral placed over a painted sign. So basically it was going to have a much greater degree of wear than the rest of the sign. The 1 sign all the way over on the left was NOS but it doesn't have a vinyl number and wouldn't have worn as much as the 177. If you look around enough on the shield gallery I believe there are examples on CA State Highway signs where the numeral has a higher degree of wear than the rest of the sign just like my 177. The 46 and 299 are much more recent and are reflective vinyl completely. The Highway 98 is just a street blade off of US 98 in Alabama, been looking for anything related to said route for a long time. The real prize here is the NV 375 which of course is the Extraterrestrial Highway which runs east of Groom Lake. Surprisingly nobody else really put any serious bids on the NV 375, I would suspect that outside the road geek community nobody knows what it actually is. 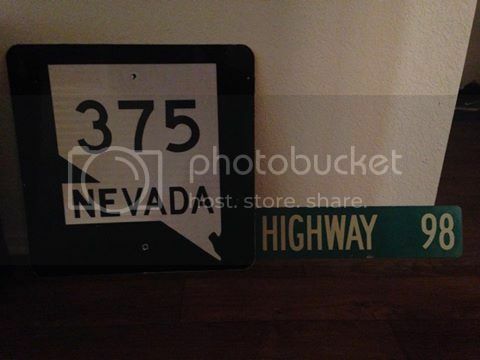 Have been looking for some route marker signs, but haven't really bothered to check EBay, etc for them. 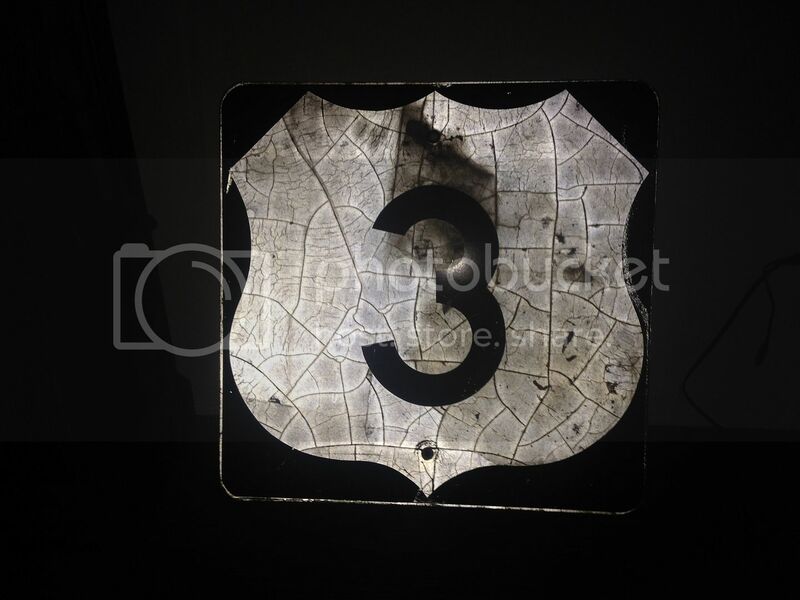 I did recently see an ON-33 marker in an antique store (in Thomas, WV for some reason), but they were trying to charge an insane $275 for it (despite it being relatively new). I didn't feel like trying to haggle, so I left with a 1951 GE clock radio for a much more reasonable price. Yeah you get a lot of idiot sellers who think even modern signs are some sort of priceless antique. 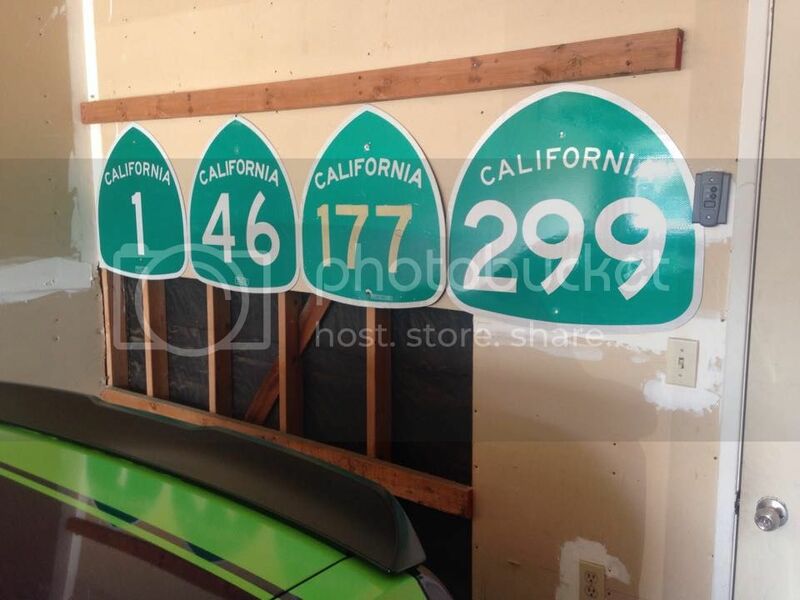 There is someone trying to pedal a bunch of modern California signs like US 101 and CA 1 for $1,200 on eBay. For what it's worth I paid $31 for the NV 375, there are plenty of deals to be had online if you are willing to look long enough. 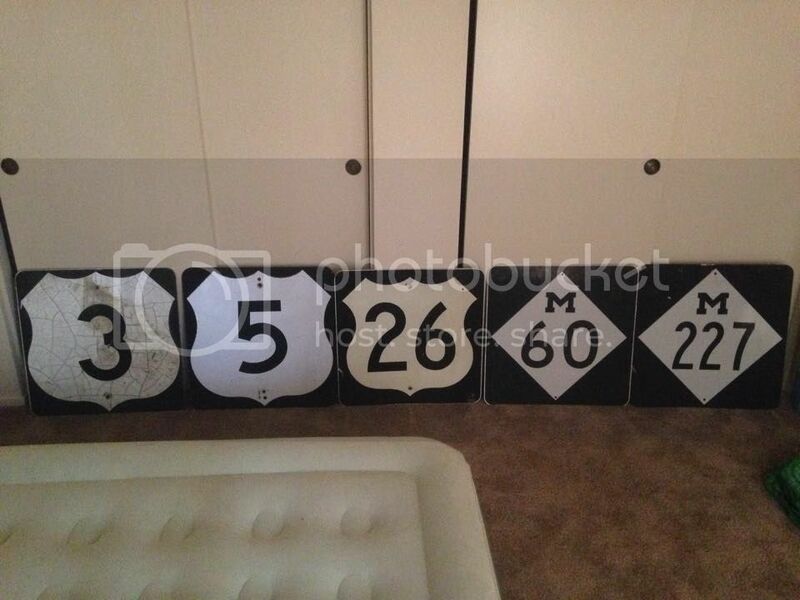 The most I've spent on a sign is $69 on the 1950s era NY 25 sign. Most I've acquired for $20-30 each, some as low as $10. Those are some nice traffic lights. I'm sure that 5th Ave was on the higher side of the coin that you listed. Some of the cheapest, actually. Some plastic recycling company was selling them on eBay 5-6 years ago and I managed to get them for opening bid which was about $12. Nice, it's amazing what ends up in their hands because they have a DOT contract sometimes. The bulk of my stuff came from scrappers, it's all profit for them at the end of the day. definitely a Long Island based collection. I have a single NY 82 shield I got years ago at an antique store. From waht I gather Route 82 is somewhere upstate. Only "sign" I have is a replica cut-out Route 66 shield I got from my visit to California last year. Who knows where the road goes? Of course! Google maps! I've got one of those for Illinois. The US 26 actually has an Idaho department of transportation sticking showing it was made in 1974 despite the 1961 design. I really don't like the modern design of the US Route shield...it looks bloated. There's only one route sign I'd ever want to get and I doubt it's available anywhere: The old Bert T. Combs Mountain Parkway sign. 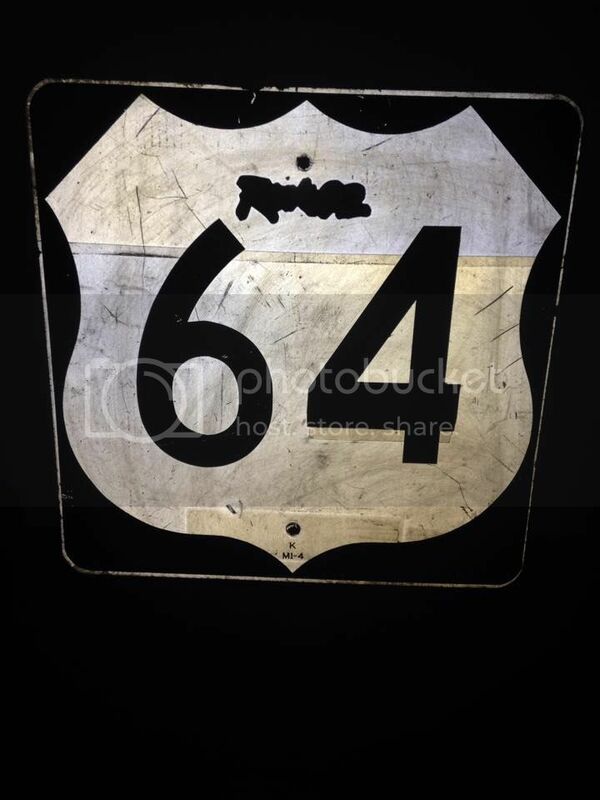 Congrats on joining the US 64 club (and getting a sign you were looking for)! Indeed it was. Last of the active U.S. and Interstate routes I was looking for that go through Arizona. Pretty sure I'm now under 20 left to go with US 64 and US 26. When I lived in Texas it was in the western part of the state where there wasn't too many state highways, mostly US Routes...so meh on that. And I only spent summers with family and friends for multiple years in North Carolina and Illinois when I was a kid. Given that we're talking Asheville and Chicago for me the state highway markers don't do it for me. The only one I listed that I never lived in or worked in was Colorado, but I've spent so much time there and so many great state routes...I figure why not?